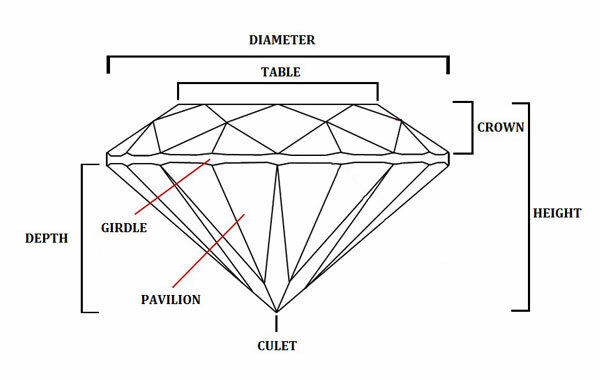 The Four C’s that are unique to each diamond determines the quality and value of a finished diamond. The Cut is the most vital of all characteristics in a diamond. The way a diamond is cut makes an essential contribution to its interaction with light. Diamonds have an exceptional capability to reflect and manipulate light to maximize their brilliance. A skilled cutting allows the light to be dispersed and reflected as a rainbow of color, which gives a diamond its incredible brightness, fire and scintillation. Diamonds that are cut incorrectly lose light through the sides or bottom of the diamond resulting in a poor, less brilliant diamond. Cut grading is determined by looking at a diamond’s overall face-up appearance, fire, brightness, scintillation, weight ratio, durability, polish and symmetry. The cut grade varies from excellent to poor cut. Color is the second most important characteristics of a diamond after cut. Diamonds come in different colors, but the most common color is subtle shades of yellow and brown. The translucent diamonds are considered to be structurally perfect, but they are rare to come by. Diamonds get their color by the presence of trace elements like nitrogen, which imparts yellow color, boron imparts blue color or sometimes the natural radiation from nearby rocks trap electrons impart green surface color and pink or red shades are due to changes to the electron structure during the voyage to the surface. Diamonds are valued by how closely they approach colorlessness - the less the color, the higher their value. A color grade of D is the highest grade possible, while Z is the lowest on the scale. Diamonds have internal features called inclusions and surface irregularities called blemishes. Clarity is the relative absence of inclusions and blemishes. 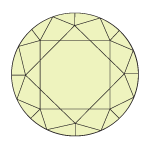 Diamonds with the least and smallest inclusions receive the higher clarity grades. Diamonds that have no hints of inclusions or blemishes are graded flawless /internally flawless clarity. All diamonds are graded for clarity using the 11point diamond clarity scale created by the GIA. Diamond weight is expressed in metric measurements called carats where one carat is equal to 200 milligrams. The word carat originates from the Greek term Keratin for fruit of carob. In the earlier times there was absence of an accurate unit for precise weight measurements of diamonds. The small seeds of the carob fruit were considered to be fairly uniform in size and weight. Hence they provided a consistent basis for gem weight. Early gem traders used this method until 20th century when a carat was standardized as 0.2 gram. Here weight equals money so cutters try to retain as much weight as possible when they fashion diamond rough. However two diamonds of equal weight can have very different values depending on the other members of the Four C’s, which are cut, color and clarity.